Western blot analysis of extracts from HeLa cells, transfected with 100 nM SignalSilence® Control siRNA (Fluorescein Conjugate) #6201 (-) or SignalSilence® ILK1 siRNA I #6202 or SignalSilence® ILK1 siRNA II (+), using ILK1 (4G9) Rabbit mAb #3856 and β-Actin Antibody #4967. 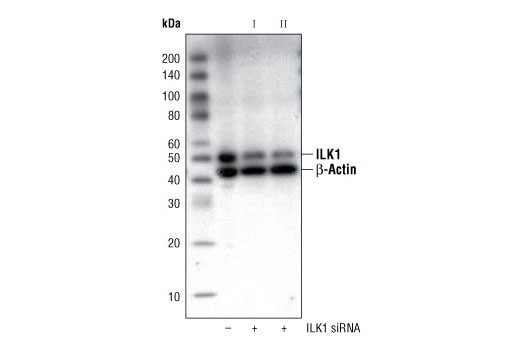 ILK1 (4G9) Rabbit mAb confirms silencing of ILK1 expression and β-Actin Antibody is used to control for loading and specificity of ILK1 siRNA. CST recommends transfection with 100 nM ILK1 siRNA II 48 to 72 hours prior to cell lysis. For transfection procedure, follow protocol provided by the transfection reagent manufacturer. Please feel free to contact CST with any questions on use. SignalSilence® ILK1 siRNA II from Cell Signaling Technology (CST) allows the researcher to specifically inhibit ILK1 expression using RNA interference, a method whereby gene expression can be selectively silenced through the delivery of double stranded RNA molecules into the cell. All SignalSilence® siRNA products from CST are rigorously tested in-house and have been shown to reduce protein expression by western analysis. Integrin-linked kinases (ILKs) couple integrins and growth factors to downstream pathways involved in cell survival, cell cycle control, cell-cell adhesion and cell motility (1). ILK functions as a scaffold bridging the extracellular matrix (ECM) and growth factor receptors to the actin cytoskeleton through interactions with integrin, PINCH (which links ILK to the RTKs via Nck2), CH-ILKBP and affixin (1). ILK phosphorylates Akt at Ser473, GSK-3 on Ser9, myosin light chain 2 (MLC2) on Ser18/Thr19, as well as affixin (2-5). These phosphorylation events are key regulatory steps in modulating the activities of the targets. ILK activity is stimulated by PI3 kinase and negatively regulated by the tumor suppressor PTEN and a PP2C protein phosphatase, ILKAP (1,3,6). It has been suggested that the conserved Ser343 residue in the activation loop plays a key role in the activation of ILK1 (2). Wu, C. and Dedhar, S. (2000) J. Biol. Chem. 155, 505-510. Persad, S. et al. (2001) J. Biol. Chem. 276, 27462-27469. Persad, S. et al. (2000) J. Cell Biol. 153, 1161-1173. Deng, J.T. et al. (2001) J. Biol. Chem. 276, 16365-16373. Yamaji, S. et al. (2001) J. Cell Biol. 153, 1251-1264. Morimoto, A.M. et al. (2000) Oncogene 19, 200-209.